I decided last fall that I was going to expand my housing this year. I have 34 cavities available and had 15 nesting pair last year. At my old colony down the road my second year I went from 12 to 30 pair, and I could have had a few more I think. I am not expecting to see that kind of increase again this year but in case I do I want to be ready. My first T14 project was pretty cheap as I bought some rough cut hemlock boards and planed them down. I had less then $100.00 in the house and I used a 3.5 inch galvanized pipe that I got from a contractor, It's been years ago but I think it was only around $50.00 or so, maybe $60.00. I build mine out of cedar which I have sawed from old electric polls. Most of the time you can get them free or a little bit of nothing. Once sawed you can use right away as there is no drying time. It has been sow long since I bought the brake winch that I use for my current T-14. It is a Dutton-Laison and has worked fine for many years. I see they have 600 lbs, 800, 1200, 2500. I know the T14 will weigh less then 150 pounds or so, but for some reason I was thinking it was recommended to get a higher rated winch. I am not an engineer, is there a reason I would need one with a rating over 600 lbs? Martin Colony History: Landlord of colony started in 1940 by grandfather. Completely lost colony due to houses that did not provide protection from owls. New T-14 houses installed. 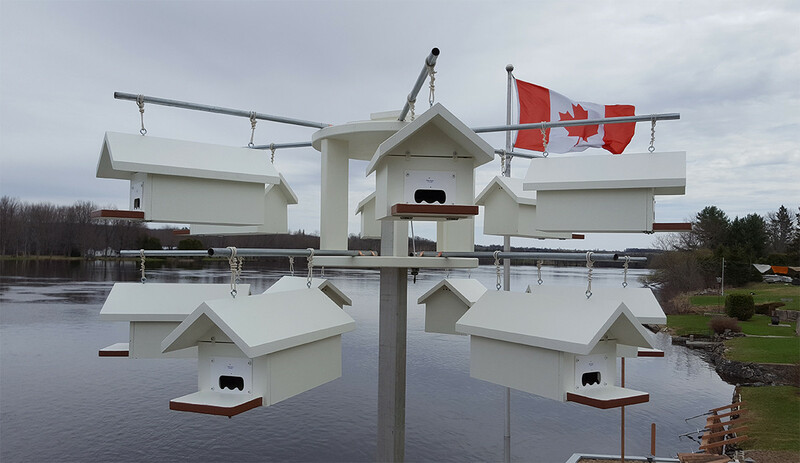 100% full with no nest abandonment due to owl guards, predator lights and decoys. Western red Cedar has gotten really expensive ! Only bad thing about a T-14 is they need better venting. Sure has been a great house for my colony. Especially the starling resistant entrances. Adding third T-14 this year to my home site. 42 nesting cavities offered. I paid $1100 for the entire set up, 18ft two piece 3 inch pole, cedar house and winch. It was $400 cheaper only a few years ago. I am just happy the PM like the design. I have built a couple of houses they did not care for. It is so disappointing to make the hole too large or too high from the perch. Have them over run with starlings. I have built/refurbished all of my houses 6 total T14's now, as well as built one for a friend of mine, some out of pine some out of western ceder....the key is keeping them covered in the winter and a fresh coat of paint in the fall all with gourds hanging from the bottom....The total you spend for the wood and the post accessories will save you a couple hundred dollars if you build it yourself For me its the fun of making them...Knowing i made them and martins are living in them....If you think adding one house more wont affect your outcome you may be surprised as i went from 1 to 3 in 3 yrs and our increase was significant....and then added three more houses for the 2019 yr....I am also now done adding houses as my front yard is starting to resemble nothing but Martin houses...and the wife has said "thats enough" 108 cavities. Before you buy cedar or fir plywood I have to give a vote to a material called MDO Signboard. It's what road signs are made of. I was skeptical at first but built my last set of chalets out of it. I did roof and porches out of eastern cedar because water may sit on horizontal surfaces more. Honestly that was a bit of overkill and you could get away with MDO board everywhere. Overall the MDO board was excellent to work with and paints as good or better than anything. It's super smooth and no voids. The core is 1/2" fir ply so you have the strength and durability of fir plywood, but the outside faces is laminated in a waterproof paper material. It might be hard to find, but worth it IMO. It's not expensive. So nice to work with, and light and strong. Here's some pictures of mine. You should try out a chalet system. The wooden gourd. I can help you with some dimensions if you want. i'm the friend that 'sugarcreek' made the extra t14 for. 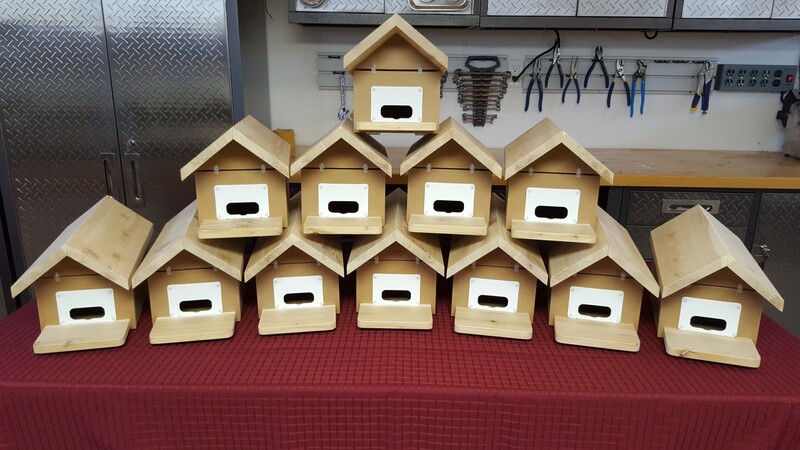 great work, mike, and tell your wife that you can never have too many martin houses, you can only have too many trees! here's to 2019. Thats what i say Mike and Tim the only thing is as you get older and keep adding like i have it gets harder but i love thoase little birds. And as you get bigger with many more loud mouth pms you become a bigger target for predators. I agree these are some nice looking houses. I picked up the pole last night. It is a 20 foot 3.5 inch OD schedule 80 galvanized pipe. This is exactly what I used for my last T14 and it has served well. It was never budged in the wind and begin galvanized no rust or painting issues. The only modification I make is to cut a slot in the top to recess and pulley into. Then I weld a small metal "box" that I attach to the pole with U bolts and then bolt the winch to that. Sounds like a plan Flyin-Lowe. I don't think you have to overdo it on the brake winch. They actually need the weight to work right. I put a standard one from Troyers on my new Gemini rack that I adapted to a round schedule 40 metal pole as well. It works great and is much safer to raise and lower. Good luck this year you should really start filling up your housing. They will be fighting to get in there soon. .
Building martin houses is a big draw for many landlords. In fact, it is the reason some people get in to the hobby. Those that like to use their hands in order to provide the martin with a cozy home should be praised for their skills and hard work and time. Great work guys. 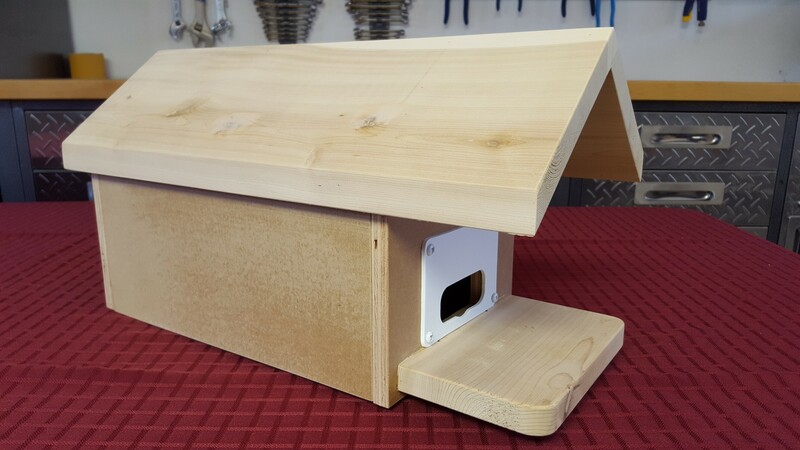 I have a wood shop and enjoy building T14s as well as other bird houses. I usually donate them to city parks and wildlife areas. It gives me a chance to get out in the wild to do nest checks at all the cavities. Last count, I had about 55 bird houses scattered in central Iowa. Ryan's martin cavities are top notch. Curious about how much you have in each chalet? I really like the looks of them, I would also be interested in how much each one weighs. I think I only needed not much more than a sheet of the MDO board. I think I paid about $40 Canadian a sheet which is $30 for you. Cedar here is cheap, maybe $1 a square foot so save $40 there tops. Hinges, clips, and eye hooks maybe another $40. That would get you a dozen chalets. Paint is paint so same cost there if you built any other house. The post is also a wash in cost i guess too. The discs i made from 1 1/4" cedar and glued them up. Maybe $30 there. For steel rods i use galvanized electrical conduit 3/4" which is 10$ a length so $40 there too. Thats about it, but lots of time for sure, especially for the painting. For weight, I shipped one to test to the US and one chalet is pretty light. Less than 3 pounds. I got the boxes assembled this week. I haven't put the doors on yet because I have ordered some SREH plates and will gut the doors and mount the plates before putting them on and put the trim on the peak of the roof. Hopefully this weekend I can get my carrier built and then make the mods I need to make to the pole. The first pic is looking down from the top at the carrier. It is built out of treated 2x8's. This is how I built my last one too. I'll drill a hole on each side and run my cable up through one side and down through the other. I just have a few screws holding it together right now as I will pull it apart to go around the pole and then put it back together and add additional screws. I built my last one the same way about 10 years ago and it is still holding up good. Here's the carrier from above.